The NFL’s 17-week regular season is preceded by the aptly-named preseason – a 4-week period during which each NFL team is required to schedule 4 “preseason games” (half of these must be played on said team’s home field), and teams involved in American Bowl games or the “Pro Football Hall of Fame Game” must play another preseason game on top of that. Games played in the preseason are counted separately from the regular season. 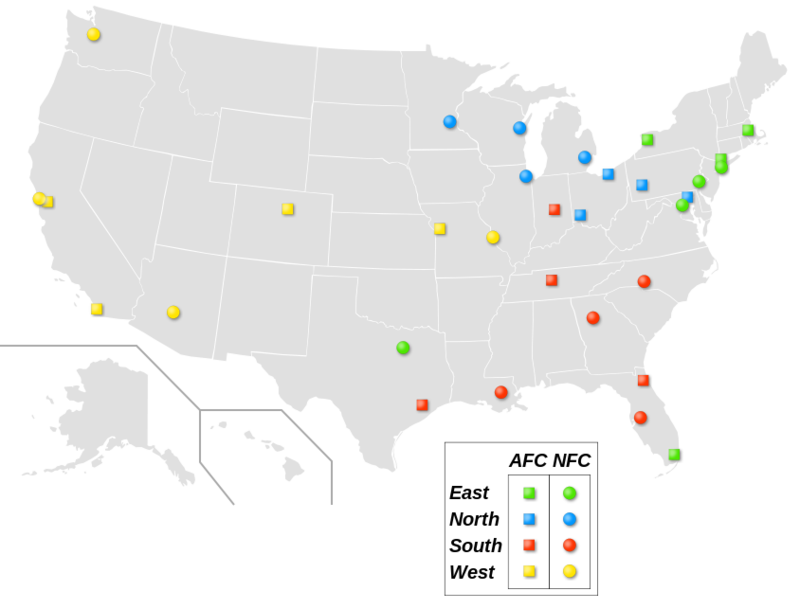 The spread of the NFL’s conferences and sub-divisions across the United States. The regular season of the NFL consists of 256 games and is split across 2 divisions (much as is the case with baseball) – The American Football Conference (AFC) and the National Football Conference (NFC). Each division features 4 “quadrants” (North, East, West, and South) and each quadrant contains 4 teams. Each NFL team is required to play 16 games. The algorithm that determines which team plays who in the NFL is rather complex. Each team must play 2 games – one on home field, and one away – against the other 3 teamsin their “quadrant” (In the case of the AFC East, for example, the Patriots must play 2 games each against the Dolphins, the Bills, and the Jets). Then, 1 game must be played against each team in another quadrant of the same division (In the previous case, a team from AFC East would play either West, North, or South) and this rotates every 3 years. 1 game must also be played against each team in a completely different division as well (AFC NFC) which rotates every 4 years. Finally, the last 2 mandatory games in the regular season must be played against teams of the same placement in different quadrants of the division. In the case of 2014, the New England Patriots finished 1st in their “quadrant”, mandating that they play the Denver Broncos and the Pittsburgh Steelers (finished 1st in AFC North and West, respectively). The NFL’s post-season is where the true competition manifests itself. The elimination tournament is set up in a fairly standard, straightforward way, and the pressure is high for each team. A single mistake could prove very costly. The “main 4” teams for each division are those who placed 1st in each subdivision (“quadrant”). The other 2 teams are denoted as “Wild Cards” and advance with the highest overall records in their conference. The process of elimination advances winning teams through the Wild Card Round, the Divisional Round, the Conference Championships, and the surviving 2 teams – one from each conference, face off in the Super Bowl. A spreadsheet grid of the 2015 NFL season’s team match-ups. As can clearly be seen, the entirety of the NFL season is not a continuous process of elimination; rather, it is methodical, and more closely emphasizes quality teamwork and overall play. The teams that perform well in the pre- and regular seasons will be rewarded with a chance to go-for-the-gold, and the true competition is only fierce and focused during the playoffs. This entry was posted in Football, Other and tagged American Football, football, format, national football league, NFL, season, sport, sports, sports and training, Sports Archives, Sports Blogs, sports history, sports performance. Bookmark the permalink.